Blackwell, nestled in the valley of the Chickaskia River, was established on September 16, 1893, the first day of the historic land run which opened the Cherokee Outlet for homesteading. Located only 20 miles from the registration office in south central Kansas, Blackwell Rock was settled in a few hours, and within a month, boasted more than 100 business buildings. 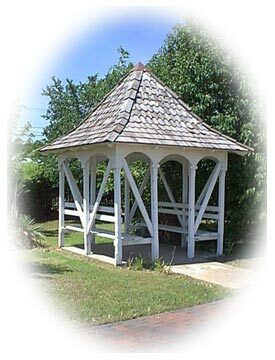 A community well was built at the intersection of Main and Blackwell Streets in 1894, and its cupola cover remains preserved over the gazebo on the grounds of the Top of Oklahoma Museum as a tribute to those settlers who risked life and livelihood to build new homes on Oklahoma's prairie. The Electric Park Pavilion constructed in 1913 marked the arrival of electricity with over 500 lights that could be seen for several miles across the prairie. The library and public services building also reveal the pride and variety of historic architecture, as well as the vintage homes of the 1920s Oklahoma oil boom. Andrew J. Blackwell secured land for the proposed town of Blackwell Rock from Cherokee land allotments acquired after marrying Rosa Vaught, a mixed-blood Cherokee. He distributed thousands of copies of the Blackwell Eagle, proclaiming the glories of the proposed new town, throughout southern Kansas to those awaiting the start of the Land Run. Colonel Blackwell was chosen president of the town council and became the first mayor. While visiting Blackwell you will want to "jump aboard" at the DeRailed Railroad Museum, then relax at any of the eleven city parks. Blackwell is also home to the Kay County Fair and the Tulips-A-Bloom Festival in April and the Bows lighting display in December. Blackwell features many shopping options including five antique malls with almost 300 dealers open seven days a week. Many charming specialty shops can be found in the Blackwell central business district. Plus, for the treasure hunter, a giant flea market is open the first Saturday of every month at the Fairgrounds. Dining is always a treat with various restaurants serving homemade soups, breads, pies, and other specialties. Many of the restaurants are decorated with period antiques, adding to one's dining pleasure. With a beginning shaped by the hooves of running horses, wheels of wagons, and boots of early pioneers, Blackwell guards her frontier roots and embraces her vision for the future. Her history speaks throughout the city with marks left by her early founders. Blackwell is truly a home on the prairie. The life of Frances Willard is memorialized in two beautiful stained glass windows that were dedicated at the Blackwell Church where Frances Willard was a member. The windows are preserved at the Top of Oklahoma Museum remembering "Our Uncrowned Queen."